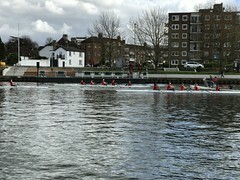 Richmond to Hampton Court on the Thames Path. 8.5m walk on the flat. Walk number 5 down the river Thames and nearly 50miles done, however a long way to go yet !. Another section of the River Thames walked on the first day of April. We drove down to Hampton court station and parked the car up for the day for £6 - on a Sunday you can park for just £2. We found the easiest way to get to Richmond the start of the walk was by public transport, just take the train to Clapham Junction then change trains to Richmond using South West trains cost about £4 on the Oyster card. On leaving the train you arrive in the centre of Richmond with loads of nice shops and bars if you fancy a pint, and then just head to the Thames path. 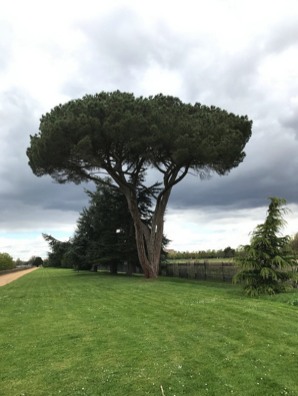 The walk is completely on the flat and makes for easy walking and takes you by some lovely exclusive areas, with very expensive properties. The side moorings of the Thames houses loads of old rowing clubs with many people out on the water zooming about in all directions. Along the path you will soon pass by Ham House a national trust property, which, we visited some time ago if you have time pop in for a look, it's well worth the visit. 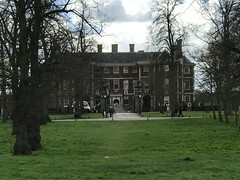 Ham House is a historic house, situated beside the River Thames in Ham, south of Richmond in London. It is claimed by the National Trust to be "unique in Europe as the most complete survival of 17th century fashion and power." The house itself is designated by Historic England as a Grade I listed building. Its park and gardens are listed at Grade II* by Historic England in the Register of Historic Parks and Gardens of special historic interest in England. Take a few minutes to look around the large locks at Teddington along the route . Teddington Lock is a complex of three locks and a weir on the River Thames in England at Ham in south west London. The lock is on the southern side of the river. 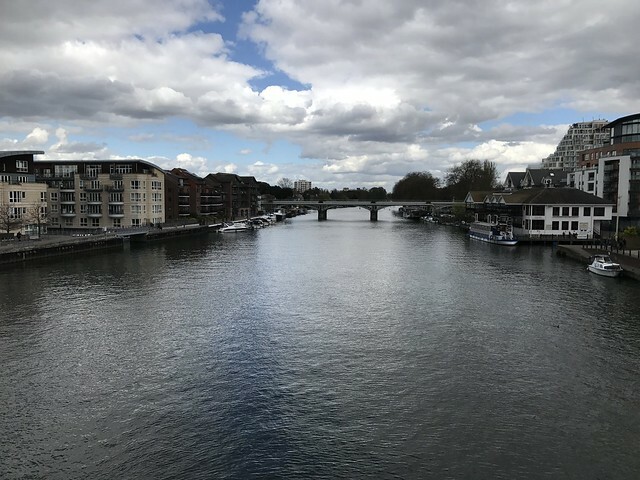 The river downstream of the lock, known as the Tideway, is tidal, though the Richmond Lock barrage downstream limits the fall of water to maintain navigability at low tide. The boundary point between the Port of London Authority, which is the navigation authority downstream, and the Environment Agency, which is the navigation authority upstream is marked by an obelisk on the Surrey bank a few hundred yards below the lock. 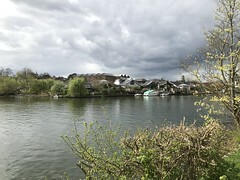 Though Teddington marks the tidal limit, in periods of very high fluvial flow the tidal influence can be seen as far upstream as East Molesey, location of the second lock on the Thames. Hampton Court Palace is a royal palace in the town of Hampton, Richmond upon Thames, Greater London, England, 11.7 miles (18.8 kilometres) south west and upstream of central London on the River Thames. Redevelopment began to be carried out in 1515 for Cardinal Thomas Wolsey, a favourite of King Henry VIII. In 1529, as Wolsey fell from favour, the King seized the palace for himself and later enlarged it. Along with St James's Palace, it is one of only two surviving palaces out of the many owned by King Henry VIII.